SelectHub is real people helping you find the best Workforce Management software for your unique business needs while recognizing the leading WFM system tools vendors who help make your decisions possible. The top workforce management software helps HR practitioners handle employee time and attendance, scheduling, workforce planning and optimization. It is designed for organizations that hire a significant number of hourly workers and are focused on the successful management of their employees. Workforce management (WFM) has acquired increasing importance as a strategic partner in assisting companies as they deal with a top business challenge in both the national and global economy — the inability to provide enough people to fill jobs. This battle for new recruits happens across all industries. As the US workforce continues to get younger, employers are noticing a growing gap when it comes to skills and qualifications. According to the Society for Human Resource Management (SHRM), 83 percent of HR professionals reported having difficulty recruiting suitable job candidates in the last year. As the skills gap has increased, workforce management systems have adapted to feature more automation and AI as well as provide better training for new and existing employees. Workforce management system software is found in the sub-category of human capital management. Alternative resources for those searching for workforce management include employee/staff scheduling, call/contact centers, talent management and HRM systems. Workforce management tools provide a number of capabilities, including scheduling, time tracking and more. By automating tasks like scheduling, HR managers free up more time to focus on other aspects of the business. Implementing WFM software can be time-consuming and expensive, but the return makes up for it. Workforce management can be described as the balancing of the different objectives simultaneously at work within an organization. Often, the demands of customers, employees and management can appear to have competing interests. Customers expect quality service levels and staff availability, employees want job satisfaction and work-life balance, and management demands efficient, profitable and sustainable operations. However, these interests, when balanced with appropriate processes and progressive management operations, can lead to exceptional customer service, motivated employees, and productive and efficient operations. This is what WFM can offer to organizations who must find a creative and effective way to harmonize the different challenges that organizations with large workforces must contend with. The purpose of workforce automation software started with the necessity of keeping track of employees’ worked time in order to provide accurate salary information. Different forms of time-tracking have existed throughout human history, but they became of critical importance with the industrial revolution and the mass mobilization of workers. Standardized work practices brought about by the industrialization of the work world required that both employees and employers have accurate data at pay time. In the event of disputes, this data provided invaluable evidence to reach settlements. Time and attendance features enable organizations to collect and track time worked by each employee. A good time and attendance application should be able to accomplish both the simple and the more challenging requests that surface in a workforce setting. Companies should be able to apply union rules and labor laws, as well as company specific policies to calculate pay. Managers must be able to monitor who comes in and out of the workplace, as well as the specific location where employees are working in real time. Additionally, managers receiving alerts for work items that require their attention should receive them with sufficient time to implement an action. For example, when an employee approaches overtime, the supervisor or manager has the time to make a decision about whether they would like the employee to work extra time or not. A good time and attendance application should be able to calculate the cost of an overtime request accurately by taking into account overtime rules. The introduction of automated practices to workforce management was not only beneficial for time tracking and accurate salary payments, but it also contributed to many workplace optimization solutions such as labor practices. Labor is usually the largest, or one of the largest, cost contributors in an organization, especially those with a large number of employees. WFM tools provide management the tools to optimize workforce practices by targeting specific challenges that may arise. For example, if the winter holidays is a peak business period for your company, forecasting is one of those tools that can be used to anticipate incoming volume by referring to historical data. If your previous holiday period required 150 additional employees to cover the increased volume, this information gives you a pretty good idea of how to plan your staffing demands for that period. But staffing is a far more complicated issue than it may appear to be on the surface. Compliance and regulatory issues are very important considerations when dealing with employees. Ensuring that they are given full access to all their legal employment rights is one of the biggest obligations that organizations have with respect to their workforce, and WFM software is an effective tool to achieve this obligation. Workforce management scheduling is a tool that assists managers and supervisors as they plan and execute intelligent work schedules that focus on all interests of an organization. This includes controlling labor costs, enforcing compliance regulations and improving productivity. Labor scheduling often involves predicting labor demands over a specified period of time. Supervisors, who are responsible for this task, are better at estimating the correct number of employees needed to cover a week or even a month but are less capable of forecasting by shift or hour for any given day. Making “best-guess” forecasts can create costly overstaffing or loss of business due to understaffing. A labor forecasting solution uniquely helps supervisors accurately predict sales and labor needs within very small increments of time, e.g., every 15 minutes on a daily basis. Forecasts are based on a range of metrics, such as sales, transactions, customers served and units sold, which, in turn, can be analyzed to forecast business volume across each day, down to the 15-minute interval. The early forms of time tracking involved pen and paper and were inevitably prone to time record-keeping errors, from legibility issues to mistakes with double data entry. Improvements were introduced; one of these was the mechanical time clock, which provided increased accuracy but was not foolproof. “Buddy-punching” was one of the “creative” ways the system could be corrupted by employees. The advent of the information age has automated the workforce management process, and applicable software allows for the creation of very sophisticated time tracking systems, which work towards eliminating more and more inaccuracies. The level of involvement or satisfaction of an employee can be a big determining factor when it comes to productivity. Employees want more accessibility to their job information, such as how they receive payment, request time off, etc. Workforce management software is changing to allow more self-service portals for employees so they can have more control over their employment. This is essentially the end goal of using WFM systems. With more accurate time tracking, automated smart scheduling and higher overall employee satisfaction, you should expect your productivity and efficiency to increase. Automation helps reduce human error and can analyze data much faster than it would take to do so manually. As a result, customer service should improve along with the overall productivity of your business. In order to achieve these goals, however, you can’t simply go ahead and implement the first system you find. You’ll need to choose a system with core functions as well as the specific tools your business needs. The rest of this article will go over important features as well as questions to ask yourself and vendors as you create your requirements list. Online employee scheduling is a valuable tool that provides management with the data required to make intelligent decisions that involve the optimal scheduling of employees within an organization. The scheduling of employees can become complicated; for issues such as over or understaffing, accurate forecasting can be used to assure the right number of employees for each and every shift, on every day of the year. Optimizing the scheduling can positively impact costs and the use of resources to their fullest potential. Workforce planning is a core function of WFM and can be thought of as a business process that identifies and analyzes an organization’s needs in terms of size, type and quality of workforce. It’s a continual process that strives to align the needs and priorities of the organization with those of its workforce. This process is also a prime generator of business intelligence that can be used to examine the impact of internal and external factors on the organization. Workforce optimization focuses on continually improving the customer experience. It accomplishes this important goal by ensuring that all aspects of the customer experience are assessed and optimized. For example, it examines issues like what processes can be automated, how to make key data more available and accessible to support better decision-making by management, and how to ensure that compliance issues related to employees are strictly adhered to. Time clocks have come a long way from the manual in and out punch card. Software-based time clocks collect and store employee time and attendance digitally, eliminating paper timesheets and timecards. Digital time clock software enables supervisors to make edits, create reports from collected data and digitally export time data to most payroll providers. Digital time clocks offer a variety of models: swipe card, biometric and proximity time, mobile device punching with or without geofencing, etc. Employee time and attendance records should incorporate company policy with regard to overall employee attendance behavior, as well as provide data for issues such as tardiness, breaks, etc. Data that is collected from time and attendance records can be useful to managers to incentivize employees who may need some attention. Leave management has the potential to be a heavy administrative challenge for managers and HR departments. Leave management applications automate many of the processes required to manage all aspects of employee leave policies and practices, while ensuring your organization’s compliance with existing and changing regulations. These tools track and manage all tasks involved with administering a leave. These tasks include reporting, documenting, providing a due date for leave and all details from start to finish. The compliance aspect of leave administration is particularly important because of the number of local and national rules that impact this employee benefit. Collaborative scheduling was put in place for the benefit of employees. This application can be used by employees to have a measure of control over their work lives. They can edit and set their work preferences, thereby resulting in a better work-life balance and more consistency in their schedules. If an employee forgets to punch in or out, they can report their issue to a supervisor and receive an alert for approval. Depending on what system(s) you already have, you’ll want whichever WFM solution you choose to be able to integrate with them, specifically with payroll. Integration with payroll is essentially the ability for time data to flow directly into payroll for salary calculation. Along with the key features needed in workforce management systems, there are several other features to consider. These secondary features will vary based on the vendor you choose, so it’s important to do your research to know which you’ll need and which you won’t. Two important initial considerations that begin the process to minimize the risk for your employees and your organization include identifying the sources of fatigue and monitoring and managing fatigue. Identifying the sources of fatigue will inevitably involve an audit and a review process of all aspects of job types, including shift patterns, special tasks involved in a job category, with the goal of identifying specific sources of fatigue and an individual employee's’ fitness for a particular job. Monitoring and managing fatigue examines data from activities like hours worked, tasks performed, breaks taken and time-off scheduled. The data from all these factors are then compared against a “fatigue classification” prepared for all employees. This should enable management to identify “at risk” employees and making the necessary scheduling or staffing changes. This software will hopefully set in motion a process that identifies work patterns and conditions that create fatigue.These are challenging responsibilities for your organization, but critical enough to direct the necessary attention and resources. Labor analytics are essentially a compilation of all the labor data about your employees that has been extracted from the multiple applications at work within the WFM ecosystem. Examples of this data include amount of overtime, absenteeism, schedules, productivity and more. This is critical data that allows your organization to analyze and refine WFM activities. But without the ability to analyze and act on this information in a timely and meaningful manner, most of the benefits are lost. An analytics tool, as part of the larger workforce management app, becomes essential for transforming the data into actual policy. This tool also functions as an important source of information in a larger conversation concerning financial objectives for your organization. WFM tools, which are principally focused on the effective management of an organization’s talent resource, provide the data to harness all the information and analyses that will improve and fine-tune business planning and WFM activities. Needless to say, the more recent trend in both public and private labor legislation has been toward greater security and protection for employees. This development increases the complexity and the cost for employers, making the need for software in this area much more important. Different users can be assigned various levels of accessibility to certain information. In order to decide which additional features are necessary, come up with a list of workforce management software requirements specific to your business. Assessing individual vendors for the purpose of selecting the best WFM software for your organization does not differ too greatly (if at all) to the processes used for all software selection. The beginning of the process is always in house, with a close examination of your organization’s unique WFM needs. There may be many similarities across an industry, but no two organizations are exactly alike. You can make those differences work for you by focusing on what is unique in your circumstance and ensuring that those priorities are covered. This approach has a greater opportunity of meeting your needs and producing a successful conclusion than many others. There are plenty of software out there with good reviews, before choosing one, make sure to compare your options. For an in-depth review of our top WFM software solutions, consider taking a look at our WFM software comparison report. What’s wrong with how you are managing workforce operations today? What manual workarounds are you relying on today to get work done that your WFM system needs to automate? Are you still creating the schedule on your own? Are you able to properly track employees who work flexible hours? What kind of workforce management system will you need? Will you want a cloud-based system or do you have an IT team to handle updates and problems with an on-premise server? 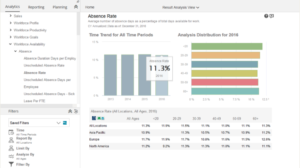 Does your workforce management software provide analytics for your business? How well does each vendor know my industry? The vendor’s knowledge of your particular industry is crucial. Software configurations are industry specific, therefore vendors must be well versed on industry regulations, best practices, legal requirements and union regulations. Can I expect my vendor to be around for a while? With so many different software to choose from, do some research to see how long your vendor has been in business and what their future looks like. Ensure the vendor’s solvency, as you will want to ensure that they will be in business for a while. Much of the content that they provide with the software is legal in nature and will require ongoing updating to ensure it is relevant. What amount of customer support does each vendor offer? A vendor should offer a significant level of service and support post-purchase. Organizations with a larger workforce have serious responsibilities to their employees. If your payroll data has errors and cannot be submitted for processing, your vendor must be prepared to step in and resolve the problem. Make sure you have obtained and verified vendor references that are specific to your industry before seriously considering a business relationship with that vendor. Finally, this software is expensive and the implementation process is both time consuming and fairly complex. This is an investment that will be in place for a significant length of time, hence the importance to take your time to choose wisely. Furthermore, most WFM solutions are delivered as cloud-based software, purchased and installed in a phased, “as needed” approach. Depending on the size of your business and what you hope to accomplish with your workforce management software, a cheaper option may be just right or not enough for your business. Workforce management software solutions are changing the way businesses are going about their daily routines. Increased automation over a broad range of labor-tracking and other activities is working to optimize business practices. BizRun is cloud-based human resources (HR) software that frees up more time to run your business. We believe that the simpler solution is often the better solution. And, in the power of innovative visual interfaces that create shared understanding and engagement. With BizRun, Managers and employees interact with a living org chart to perform daily HR tasks and view where they fit within the business. Core features include timekeeping, PTO and leave management, centralized employee recordkeeping, photoboard, compensation management, employee supervisor self service and organizational planning. BizRun’s configurable workflow automates the routing, review, and approval of time cards, leave, onboarding and more. In addition, the business can track and manage important training, licensing and certifications information and dates. The application uses role-based security and offers numerous customizations and reporting to administrators. In addition to core HR, BizRun offers an online, cloud-based payroll processing module that is synced with timekeeping providing users with an end-to-end HR suite.BizRun can be accessed on a mobile phone, desktop or tablet and has a subscription-based pricing model that scales by the number of employees. People-Trak is a user-friendly, integrated HRMS that offers a complete package of core HR, strategic HR and workforce management applications. It includes personnel tracking, benefits administration, applicant tracking, employee evaluation, time attendance modules, and more. ServiceMax delivers the future of field service, today. The only complete suite of cloud-based, collaborative and mobile field service applications, ServiceMax gives companies unprecedented capabilities in field service management to optimize operations and delight customers. Companies use ServiceMax to handle everything from contract entitlements to scheduling workforce optimization, to inventory parts logistics and real-time customer and partner portal access. Our completely integrated Software-as-a-Service (SaaS) cloud-based suite of HRMS, Payroll Processing and Time Labor Management solutions, delivers innovation, productivity and control. All this, built within the framework of our proven dedicated service model, ensures our clients can efficiently manage their staff – from recruitment through retirement. Our scalability and flexibility allow us to create a solution that fits your needs today – and will grow with you as your needs change. Effectively managing a workforce of any size requires tight controls and policies be in place to avoid lost time and productivity. An integral part of this solution is having the right solution in place to track time, absences, and properly schedule your labor. Oracle's workforce management solutions allow you to forecast labor and workload demand, define and assign schedules to meet business objectives, capture time worked, absences and other labor data, track adherence to schedules and productivity, and adhere to labor laws and pay rules. Empower harnesses an industry-standard, innovative and cutting-edge technology, coupled with unique design and programming techniques, to offer a robust, efficient, effective and flexible suite of integrated browser-based HR software services and solutions. Paired together according to your needs, our products create the complete package of human resources software and services which enable you to effectively recruit, retain, manage, schedule, and pay employees. Store managers use SAP Workforce Management (WFM) to plan, create, and maintain employee schedules. The process starts by defining your organization business variables and your locations; adding the employees you want to schedule for each location; and identifying the drivers which determine the levels of work necessary to complete each task at a location, including actual sales and traffic data. Our SaaS workforce scheduling product promotes workforce flexibility and employee collaboration unlike spreadsheets, non-optimizing cloud-based scheduling products or cost control focused vendors. Workplace empowers managers to create optimal schedules, powered by intelligently forecasted demand and collaborative workforce input, which support both business goals and employee work-life balance.